ignore the war by supporting the troops. I don't hate the troops. I hate the war. I hate that troops have to die for political reasons. Support the Troops by BRINGING them home. 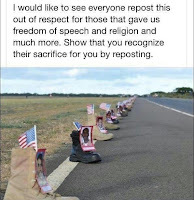 These boots have been floating on Facebook as an effort to coax Americans into supporting the war by "re-posting." They use guilt to gain support. The premise is to support the "troops." All this does is make the war drag on and line the pockets of the war machine. It is sad that we have to give up life, for death. Many wars aren't fought over freedom of speech. Some are fought for the spoils of war. 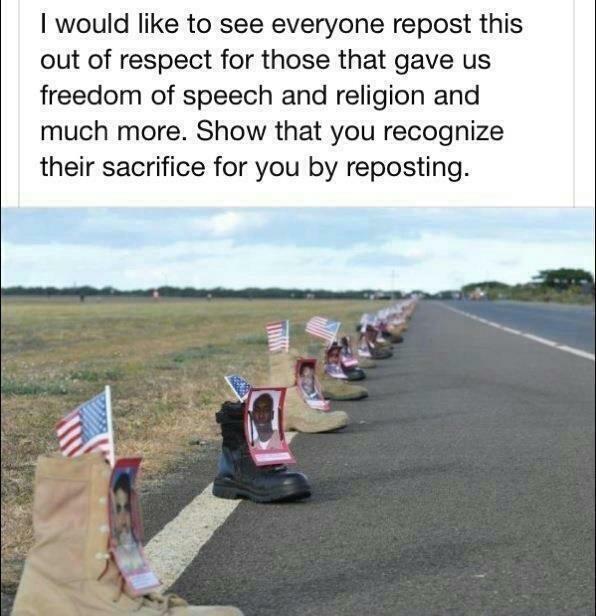 It makes me grieve to see these boots; knowing the battle was premised with falsehoods and lies from our leaders. No one should die for oil and no one should die for a lie. It makes me grieve.